Augustus Saint-Gaudens, “Augustus Saint-Gaudens,” Histories of the National Mall, accessed April 23, 2019, http://mallhistory.org/items/show/146. A prominent sculptor of memorials and monuments since the 1880s, Saint-Gaudens was a member of the Senate Park Commission. Formed in 1901, this commission was charged with developing the National Mall and other areas of Washington, DC. Saint-Gaudens not only created sculptures but designed the landscape around them to enhance their beauty. He brought his experience and ideas to the National Mall, incorporating landscape designs to frame the statues, monuments, and memorials of the Mall. Photograph Archives, Smithsonian American Art Museum. View original. Augustus Saint-Gaudens was born in Dublin, Ireland in 1848. Later that same year, he and his family emigrated to America and settled in New York City. 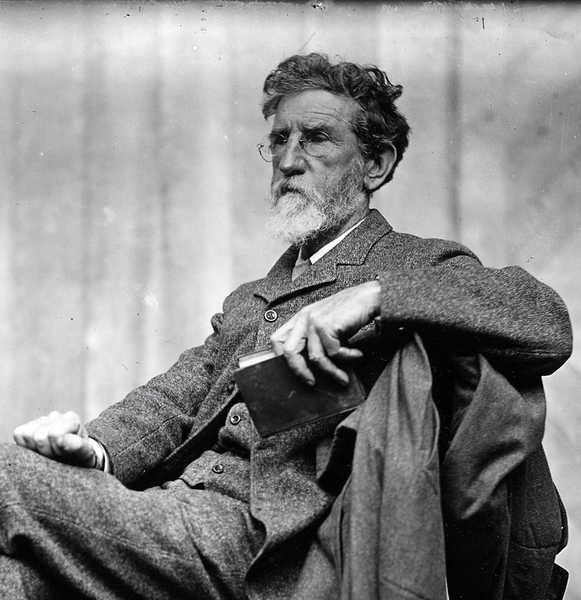 Saint-Gaudens left public school at age 13 to learn the trade of cutting cameos. Cameos are small relief-carved objects which were a popular form of jewelry in the 1800s. From age 13 to 19, Saint-Gaudens worked for cameo-cutters while taking art classes in the evening at the Cooper Institute in New York. He left the United States for Paris in 1867 to visit the International Exposition and to attend the Ecole des Beaux-Arts, a well-known and influential art school, where he was accepted as a student of sculptor Francois Jouffroy. When the Franco-Prussian War began in 1870, Saint-Gaudens moved to Rome, where he created and sold copies of classical sculptures to tourists. He received his first original sculpture commission in 1874 for a statue at the Masonic Lodge in New York City. In Rome, he met and fell in love with Augusta Fisher Homer. Saint-Gaudens returned to New York in 1875 in search of long-term work. He won the commission to design and build a monument to US Navy Admiral David Farragut. Shortly after signing the contract, Saint-Gaudens and Homer married and immediately returned to Europe. They lived abroad during the five years he spent building the Farragut monument. By 1881, the Farragut monument was installed and Saint Gaudens and his wife returned to live in New York. His piece was well received and led to many more commissions, including The Standing Lincoln in Lincoln Park in Chicago and the Shaw Memorial on the Boston Common. He also created a statue of Diana which stood on top of Madison Square Garden for decades, and is now on display at the Philadelphia Museum of Art. He received a diagnosis of terminal cancer in 1900, and he continued to work until his death seven years later. It was during these last years of his life when he joined the Senate Park Commission to share his expertise that shaped the plans for a new design of the National Mall.